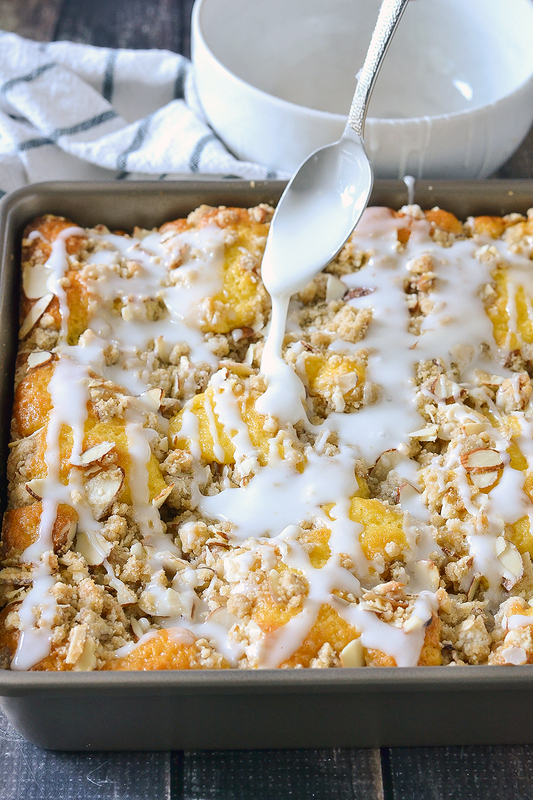 A super easy recipe for moist and delicious Peach Cobbler Coffee Cake that you can whip up in minutes anytime of year! 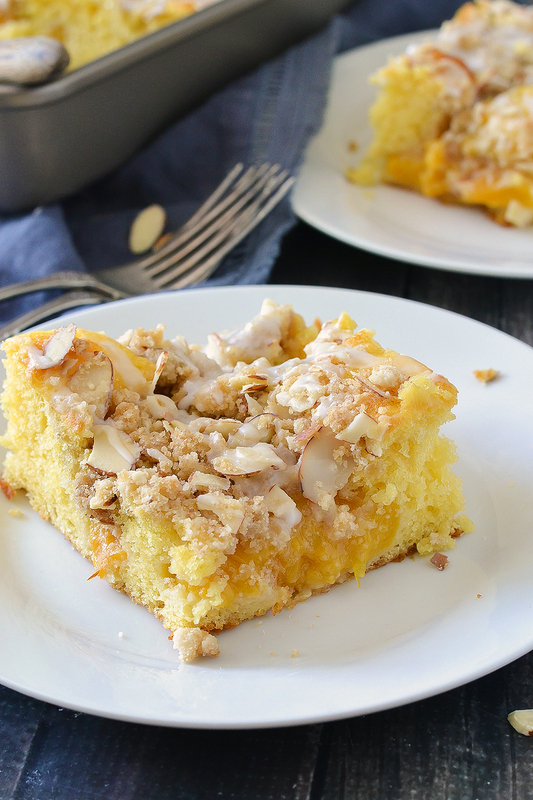 I’m LOVING this Peach Cobbler Coffee Cake! It’s so good I had to give it away or I’d eat the entire cake myself! It’s so good! 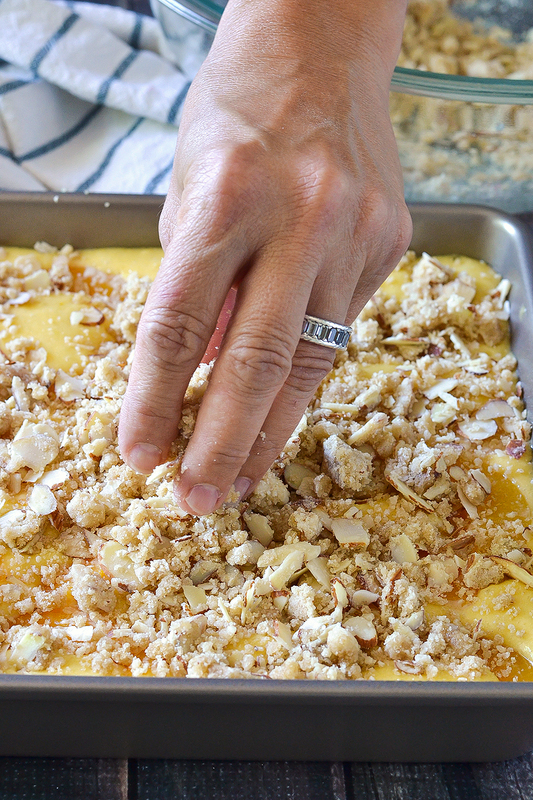 I couldn’t wait to share this Peach Cobbler Coffee Cake recipe with you! Once I perfected it I knew it was going to be hit! It seriously taste like you either got it from the local bakery or spent a long time in the kitchen baking it. I’m all about easy peasy cooking and this my friends couldn’t be any easier. If you need to whip up an easy dessert that takes minutes to make, then you have to try this! 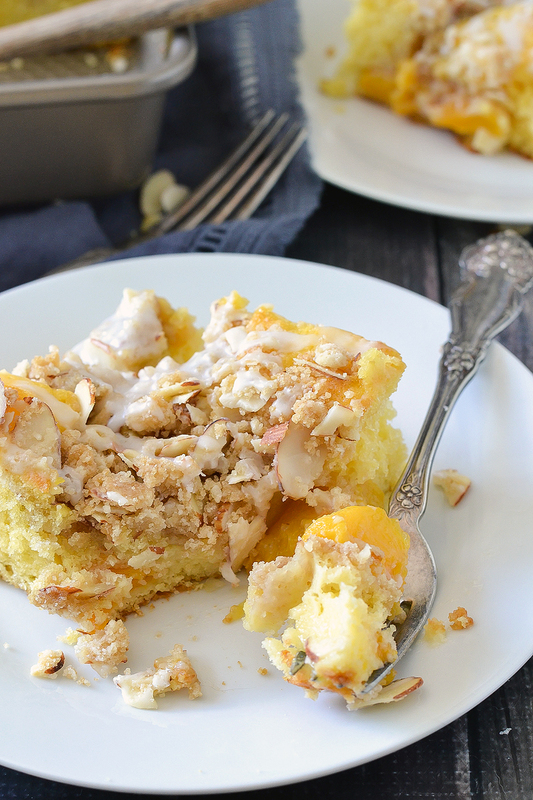 Not only this Peach Cobbler Coffee Cake easy to make but it’s LOADED with a ton of flavor in every bite! If you love peaches and peach desserts, then you’re going to love this! With just a handful of ingredients you can whip up this tasty coffee cake in minutes. 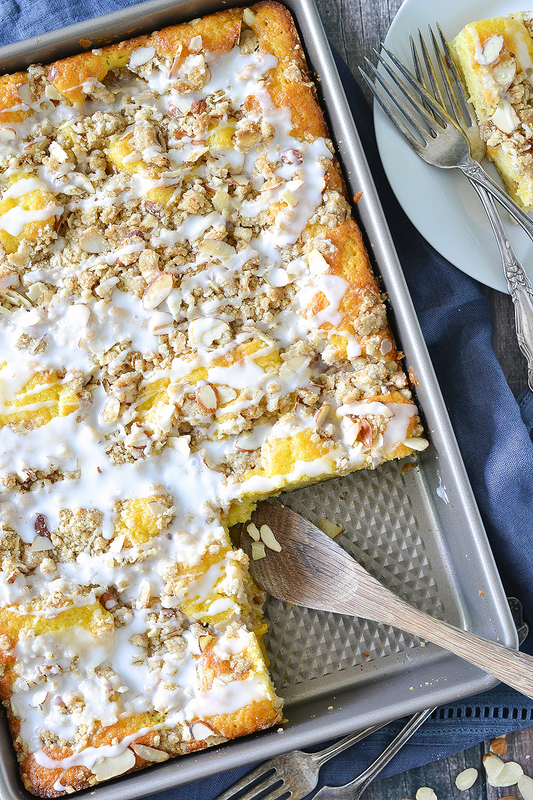 It’s perfect for a picnic, brunch with friends, or just because you’re in the mood for some tasty Peach Cobbler Coffee Cake! So what makes this dessert so easy? Well, first of all I cut a few corners and do a super market shortcut using a box of yellow cake mix. I’ve made this with both a store brand yellow cake mix and Duncan Hines yellow cake mix and they’re both great (and probably the same thing, just different boxes). 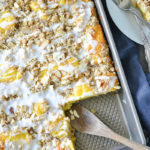 And even though it’s peach season I actually use a few cans of sliced peaches in peach juice so you could make this Peach Cobbler Coffee Cake year round! I used Del Monte sliced peaches in peach juice but any brand as long as it’s in peach juice would work. The peach juice is essential in this recipe since I use the reserved peach juice in the cake mix for a little extra peach flavor! What I also love about this recipe is the hint of almond extract. I also add sliced almonds to the crumb topping. The peaches and the almond flavor is such a great combination! This delicious Peach Cobbler Coffee Cake is topped with a yummy cobbler crumb topping and a sweet glaze! The perfect summer dessert that you can enjoy year round! A super easy recipe for moist and delicious Peach Cobbler Coffee Cake that you can whip up anytime of year! Grease a 9x13 baking dish and set aside. In a large bowl mix together cake mix, 1 cup reserved peach juice, oil, eggs, and almond extract until combined. Toss sliced peaches with flour. Lay sliced peaches on top of batter. In a medium bowl mix together flour, almonds, sugar, and butter until combined and crumbly. Sprinkle topping evenly on top. Bake cake in preheated oven for 23-28 minutes until cake tester inserted into the center of the cake comes out clean. One cake has cooled mix together confectioners sugar and milk 1 tablespoon at a time until glaze is combined. Glaze should be thick. If it's too thin add a little more confectioners sugar. For this recipe I use Duncan Hines yellow cake mix and Del Monte sliced peaches in peach juice. Oh, my…this looks absolutely delicious! Too bad I just gotback from the market and saw this. Next trip will get ingredients. Can’t wait to try it. Giving 5 stars now because it can’t be anything but excellent!